A Flemish racing pigeon nicknamed "the Lewis Hamilton of pigeons" has fetched a world record of €1.25 million at auction. Five-year-old Armando, considered one of the best racing pigeons in the sport's history, was sold to a Chinese buyer on Sunday at an auction in Knesselare, East Flanders. "He's the Roger Federer, the Lewis Hamilton of pigeons," said Fred Vencaillie, a pigeon-fancier in Perwez, West Flanders. "He's a pigeon with courage and willpower who has already won many awards." Armando had belonged to a family of breeders in Ingelmunster in West Flanders and is Belgium's best-ever long-distance racer. As he reaches retirement age, his new owners will be hoping he will father a new generation of champions. "Chinese buyers have been the biggest fans of Belgian pigeons in the past 10 years or so," Vencaillie added. 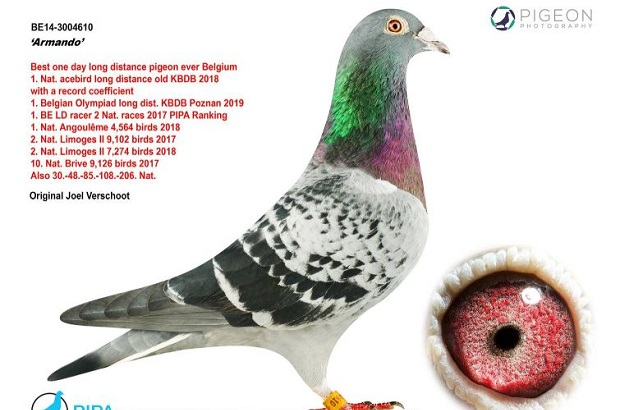 "Belgian racing pigeons have an international reputation that is growing more and more."